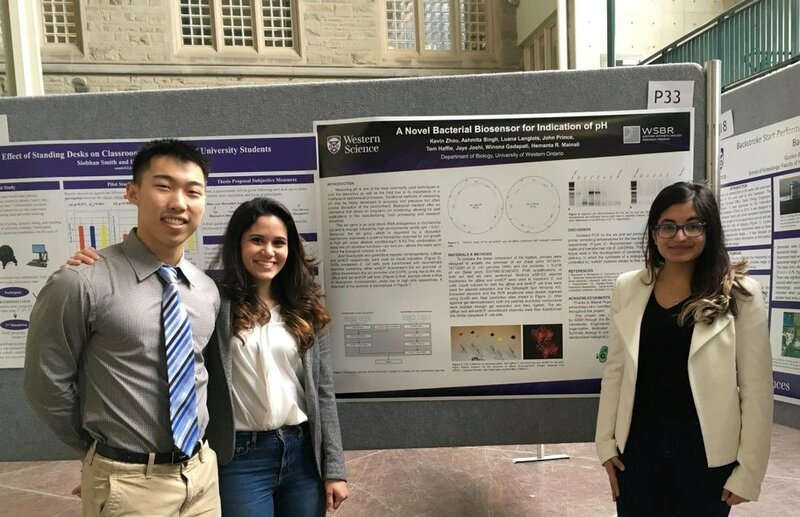 As the synthetic biology scene grows at Western University (London, Ontario), the Western Synthetic Biology Research Program (WSBR) is giving undergraduates the opportunity to design and create their own functional living systems. The WSBR club was founded in 2016 by a group of first-year students aspiring to create a team for the International Genetically Engineered Machine (iGEM) competition. Today, WSBR is facilitating two independent student projects, coordinating a focussed journal club (“SynBio Talks”), introducing high school students to synthetic biology, hosting a case competition (“SynBio Hacks”), and working with Faculty to create an Honors Specialization in Synthetic Biology. “WSBR started from a desire to see more people getting the same opportunities that we did,” said third-year honors genetics & biochemistry student, Luana Langlois, co-founder and now Co-President of WSBR. While working on their iGEM project, Luana and her peers discovered that there was a lot of interest in synthetic biology among Western students and researchers alike. As a result, they formed WSBR to give the opportunity to more undergraduates to make their own synbio idea come to life. When WSBR first opened its doors to new members in late 2016, over 200 students applied within the span of one week. New members could meet like-minded synthetic biology enthusiasts, learn about ongoing initiatives, develop new skills, and launch their own projects. While student leadership is at the heart of the program, WSBR is endorsed and supported by Western’s Departments of Biology and Biochemistry. Members are provided with lab space, equipment, funding, and most importantly mentorship. Graduate students and faculty members from the two departments volunteer by assisting the undergraduates with their projects, answering their questions, and teaching them new skills. Where are they at? Just getting started! According to its website, WSBR “[performs] scientific research in order to tackle major issues such as climate change, energy production, and personalized medicine”. This is achieved by genetically engineering algal and bacterial model organisms to carry out desired functions. Currently, there are two teams of students working on separate projects. One team is in charge of developing novel biological tools to enhance the rate of conjugation (DNA transfer) between algae and bacteria. Such tools would facilitate the synthesis of large artificial chromosomes and increase the versatility of eukaryotic systems. The other group is working on increasing the tolerance of algae to acidic environments. This is environmentally relevant as the acidification of oceans and lakes, largely resulting from atmospheric pollution, threatens algal communities and the stability of aquatic ecosystems. Past projects include enhancing carbon and nitrogen metabolism in the nitrogen-fixing bacterium S. meliloti, engineering E. coli to serve as a visible indicator of pH levels, and similarly, engineering E. coli as an indicator of temperature levels. Outside of the lab, WSBR is also involved in outreach and academic initiatives. SynBio Talks is a journal club, where anyone interested in synthetic biology can meet and discuss recent publications in the field. Representatives from WSBR also sit on a task force of Western’s Biology and Biochemistry Departments that is developing an undergraduate specialization in synthetic biology. Stepping up to the challenge: the WSBR’s case competition and iGEM team. SynBio Hacks is the WSBR’s case competition. Introduced in late 2017, it is aimed at bringing new students to the lab so that they, too are given the possibility to bring innovative ideas to life. While the competition is only open to Western students for its pilot year, Luana sees the potential for expansion in future years. Participating teams of 4 will present thesis proposals to a panel of judges comprised of faculty members. In addition to designing a practical application for synthetic biology, teams will be expected to consider funding, timelines, required iGEM kit parts, and other logistic parameters. This year’s theme is “Eutrophication: the suffocating effects of climate change”. Although WSBR was born out of an effort to create an iGEM team, Western does not currently have an official representative team. Other universities in Ontario, such as Waterloo and McMaster, have established quite successful iGEM teams. WSBR is in the process of creating a new division, “UWO iGEM”, for the purpose of representing Western in the international competition. I look forward to seeing WSBR keep growing! Learn more about WSBR at www.uwo-wsbr.com.